It’s an age-old marketing question: do you focus on all our customers or only target those who are most likely to drive results? 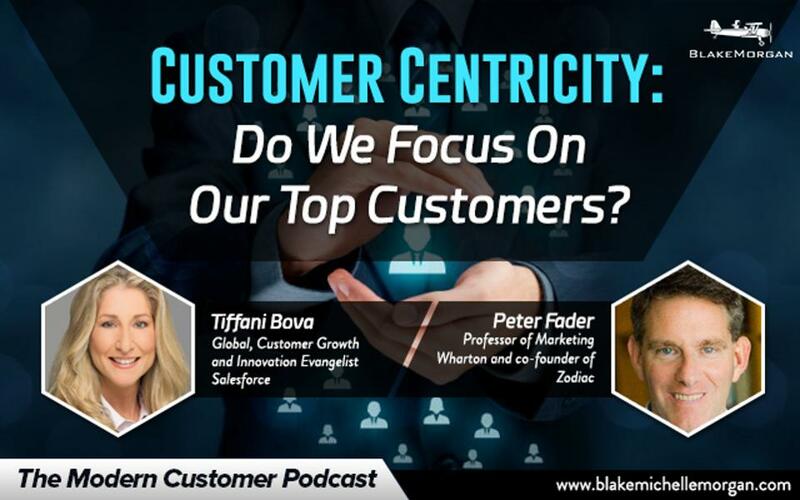 According to Dr. Peter Fader, marketing professor at Wharton and co-founder of Zodiac, and Tiffani Bova, global customer growth and innovation evangelist for Salesforce, the answer is simple: customer centricity. This year I interviewed Fader and Bova at the Wharton Customer Centricity Conference, a follow up to last year’s event when I interviewed Dr. Fader of Wharton. The idea behind customer centricity is to recognize that not all customers are created equal. Building on the differences in the customer base can be much more effective than simply using a blanket approach for all customers. By focusing on top customers and surrounding them with product recommendations and extra services, they can have an excellent experience and keep coming back for more. That’s not to say that middle and lower-tier customers should be forgotten—effort should still be put into finding the right messages and products to appeal to them, but the focus should be on targeting the right products and messages to each customer group individually. In order to truly utilize customer centricity, a company should have a good idea of its brand and why it appeals to customers. Using the vast amount of data now available, teams can see what the customers bring to the brand and what the brand brings to the customers. By understanding what drives a customer to use your product or service, you can better appeal to their needs and know how to reach out to them in the future. Much of that comes from building a strong brand that customers feel they can trust. When customers feel they can connect with a brand, they are more inclined to repeat their business, especially when that strong brand messaging is combined with product recommendations they can trust and use. Companies that best practice customer centricity make it an integral part of their brand and make a focus on the customer a hallmark of their work and culture. Customer experience is just one part of customer centricity, and companies that can build their brands, reach out to the right customers, and leverage metrics will be able to create a loyal customer base and drive great success. Blake Morgan is a keynote speaker, cx futurist and the author of More Is More. Sign up for her weekly newsletter here.